If you are looking for a Santa Claus suit, you are in the right place! 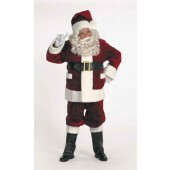 Manneco has an extensive line of highest quality of Santa Claus suits (all manufactured by Halco) - all the way from our budget minded occasional use economy suits http://www.manneco.com/santa-suits/santa-suits/economy-santa-suit.html to our most popular professional level Santa Claus suit http://www.manneco.com/santa-suits/santa-suits/professional-santa-suit.html. 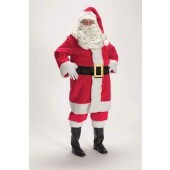 Our top of the line Majestic suit http://www.manneco.com/santa-suits/santa-suits/majestic-santa-suit.html is a magnificant outfit, We also have Velvet Santa suits, a Father Christmas suit, Mrs. Claus suits and outfits http://www.manneco.com/santa-suits/mrsclaus.html & more. 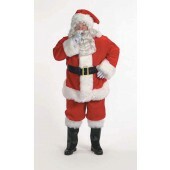 We have Santa Claus suits & outfits with shorts for the warmer or sunnier climates. We also have two very popular rental level suits. Several of our suits come complete with wig & beard sets, http://www.manneco.com/santa-suits/wigs-beards.html hat, gloves, boot tops & belts.